Samuel A.B. Lyons, born in Honolulu, is a founding member of Lyons, Brandt, Cook & Hiramatsu and is now Of Counsel to the firm. Mr. Lyons received his A.B. degree from Stanford University and his J.D. from University of California Hastings College of the Law. At Hastings, Mr. Lyons was an editor of the Hastings Law Journal, a member of the Thurston Honor Society and the Phi Delta Phi Legal Fraternity, and Order of the Coif. Mr. Lyons has an AV rating from Martindale-Hubbell, he is a member of the Hawaii and California (inactive) Bar Associations, and he is admitted to practice law before all of the Hawaii State Courts and the U.S. Court of Appeals for the Ninth Circuit. 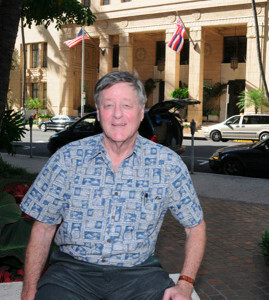 He was a longtime Fellow of the American College of Trust and Estate Counsel (1980-2007), a member of the original Uniform Probate Code Committee for the Hawaii State Bar Association, a member of the Hawaii Estate Planning Council, and a Director of the Young Lawyers Section of the Hawaii State Bar Association. Mr. Lyons also served two years active duty as a LTJG in the United States Naval Reserve. Outside the practice of law, Mr. Lyons has served as a Director of Haleakala Ranch Company, as a Trustee of the Historic Hawaii Foundation, Hawaii Heart Association, Seabury Hall School and the Mission Houses Museum, and as a Member of the Bishop Museum Association Council.